This morning we introduced you to the Treatments That Work series. Each workbook for patients is paired with a Therapist’s Guide which your doctor will use to work with you throughout your treatment. 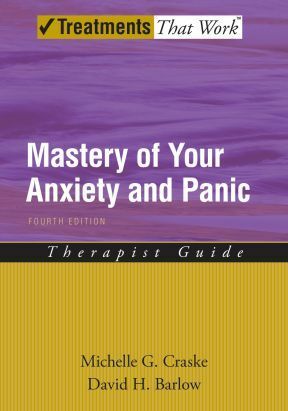 To give you an idea of what your therapist is reading here is an excerpt from the Mastery of Your Anxiety and Panic Therapist Guide about patients that have problems with the breathing exercise we learned this morning. The breathing skills may, for some clients, become a form of exposure to feared sensations (as described in chapter 10) because the exercise either forces attention on bodily sensations or induces new, unfamiliar bodily sensations. Clients who become anxious during breathing skills training for these reasons should be encouraged to continue with the exercises in the same way as would occur during interoceptive exposure practices. Notably, the research on the role of breathing skills training within cognitive behavioral therapy for panic disorder is not clear. There is some indication that it does not add significantly to the effect of exposure alone and that the combination of cognitive restructuring, in vivo exposure, and breathing skills is slightly less effective than the combination of cognitive restructuring, in vivo exposure, and interoceptive exposure. However, the studies to date have not clearly framed breathing skills as a toll for continuing to face anxious situations and instead have emphasized breathing skills as a way of reducing symptoms. As noted earlier, the program in this workbook focuses away from the immediate reduction in symptoms and fear and toward toleration of symptoms and fear. Thus, if breathing skills training is done in the way framed above, it may have more beneficial effects that when it is used as a means for controlling symptoms. If it appears that a client is using breathing skills as a control strategy, consider minimizing their use. Some clients find that the breathing exercises lack credibility. They point out that if they could simply tell themselves to breathe slowly or to relax, they would have no need for treatment, and thus, the exercise seems like a gimmick. Remind clients that the goal of breathing skills training is not to relax or calm down but to facilitate movement forward to face fear, anxiety, and anxious situations.